Rediscover the freshness and great flavour of an italian sauce just cooked. As specialists in tomato sauce, we take great care to ensure our consumers have an exceptional Italian culinary experience. All our sauces are made from 100% seasonal tomatoes grown in the field. Our family recipes are 100% natural with no added sugar. Fresh tomatoes (94%), Extra Virgin Olive Oil, Basili, Garlic, Salt, Pepper. An extra-light Sicilian recipe made with fresh tomatoes. How to do it better : Cook wtih spaghetti or penne rigate. Sprinkle everything with Parmigiano Reggiano. Tomatoes (64%), Meat Balls (18%), Carrots, Onions, Celery, Extra Virgin Olive Oil, White Wine, Garlic, Rosemary, Salt, Clove, Cinnamon, Nutmeg, Pepper, Sage. A delicious Bologna recipe, loved for its sophistication among the Italian nobility since the 18th century. Exceptional products perfectly cooked. How to do it better : Cook with spaghetti or fusilli. Sprinkle everything with Parmigiano Reggiano. 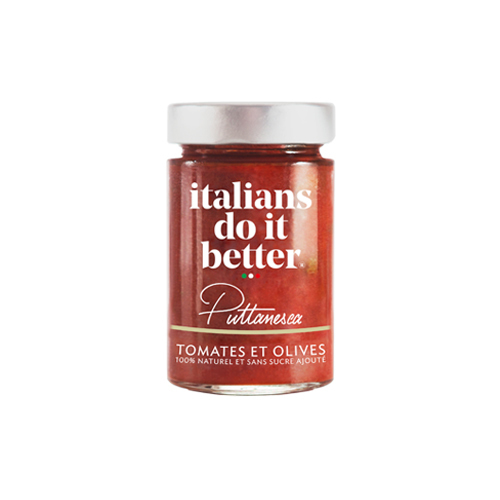 Tomatoes (80%), Smoked Pancetta (11%), Onions, Extra Virgin Olive Oil, White Wine, Peperoncino, Salt. A true classic of Italian gastronomy since the 19th century. How to do it better : Cook with spaghetti or penne rigate. Sprinkle everything with Pecorino. Tomatoes (90%), Extra Virgin Olive Oil, Carrots, Onions, Basil, Salt, Peperoncino 0,14%, Garlic, Pepper. A roman recipe that means “to be angry”. How to do it better : Cook with penne rigate or linguine. Sprinkle everything with Pecorino. Tomatoes (81%), Aubergines (13%), Onions, Olive Oil, Basil, Salt, Garlic, Peperoncino, Pepper. A Sicilian tomato sauce with aubergines, inspired by Bellini’s eponymous opera, that warms the vocal chords and charms the taste buds! Tomatoes (87%), Olives (6%), Extra Virgin Olive Oil, Salt, Capers, Garlic, Peperoncino, Basil. This recipe with character was born on the island of Ischia. Legend has it that its aroma excited Neapolitan men. A great classic in Italian gastronomy, enjoyed since the 19th century. How to do it better : Cook with penne rigate or spaghetti. Sprinkle everything with Parmigiano Reggiano. Basil (22%), Extra Virgin Olive Oil (57%), Pine Nuts (9%), Parmigiano Reggiano DOP (5%), Garlic, Wine Vinegar, Salt. The inimitable Pesto alla Genovese with 85g of fresh basil for 135g of pesto. How to do it better : Cook with penne rigate or linguine. Sprinkle everything with Parmigiano Reggiano. Little trick: in a salad bowl away from the heat, dilute the pesto with a small amount of the pasta cooking water, which is full of starch. Once the pasta is cooked, add it to the salad bowl, mix together and serve immediately. Extra Virgin Olive Oil (52%), Sundried Tomatoes (24%), Parmigiano Reggiano DOP (5%), Pine Nuts, Oregano, Garlic, Salt. The original pesto rosso made with dried tomatoes. How to do it better : Cook penne rigate or fusilli. Sprinkle everything with Parmigiano Reggiano. We’re also interested in the products we consume with the sauces: the pasta and the oil.